I subscribe to the Magazine Real Simple. I like the articles they have that help me simplify life. I LOVE the butter crunch nuts that I used to be able to get at Target but the last few times I have visited Target, no nuts. 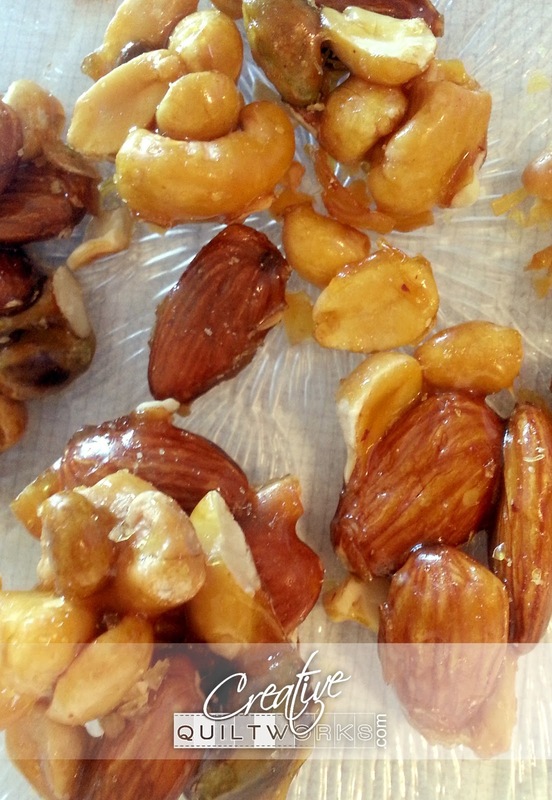 I was a little desperate for candied nuts and saw this recipe I had clipped from the magazine. So, while we were on vacation, I made the recipe and it was very good. I put the ingredients in the pan and did not swirl like the recipe says, but just let it simmer. I probably had the temperature a little higher than actual simmer probably medium low because I am always trying to speed things up in the kitchen. The stuff turned carmel color so, I put the nuts in the pan, mixed it up and poured it out on the cookie sheet. I let it cool so I didn't burn myself and Viola it was tasty. I think I let it cook just a tad too long so next time, I would accept it was carmel as soon as it starts to color up. A Pair of Blue Quilts for a Pair of Nephews! King Sized Quilt Is Finished!